Making funeral arrangements for a loved one can be a difficult and almost overwhelming responsibility. At Hamilton's Funeral Home, we listen carefully to your wishes and to every detail, providing a very personalized tribute and memorable experience. The death certificate is the original legal document that you will need regarding the person who has died. When, where and how the death occurred and other historical and statistical information are required. The Des Moines Register publishes three newspaper announcements. Charges for both printed and online obituaries and bills families directly for these services. Burial. Burial can be either in the ground or in a building called a mausoleum. Cremation. After cremation, the cremated remains may be kept in an urn, buried or scattered. Donation. It is important to remember that most medical institutions require a pre-death arrangement for body donation. There are various types of services depending on the disposition selected. A service can be public or private. It can be either before or after the disposition. All types of services require us to determine the ceremony place, day and time. Facility. Use of our facilities and staff for the visitation and the funeral ceremony. Care of the deceased. Embalming/operating room and/or any other preparation of the body. Automobiles. Transfer of remains to the funeral home and a car to go to the cemetery. Related Items. Acknowledgement cards, register book and floral record. 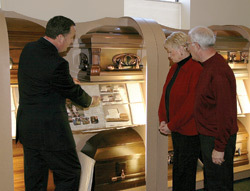 Contact Hamilton's Funeral Home at 515-243-5221 to meet with a funeral planner. We'll work with you to understand all the disposition types and costs, answer any questions and make the entire process as stress-free and easy as possible while respecting your grief. For an even better understanding of the alternatives available to you and the decisions you will be making, we have prepared a Family Information Booklet to act as a guide for all your arrangement needs. The Federal Trade Commission (FTC) - Funeral Rule has also been implemented by the United States government to help consumers make more informed decisions about funeral home goods and services. Additional information on consumer protection from the state of Iowa can be found in the Iowa Securities Bureau Pamphlet for Prearranged Funeral Plans.